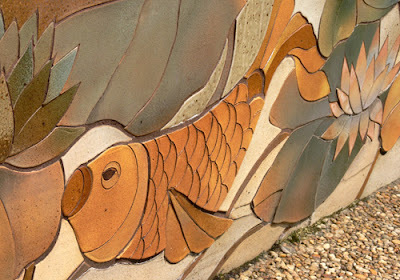 This photo is of the wall of a water feature (one of the Garden's many) between the Japanese Garden and the Garden House. The Atlanta Botanical Garden is a festive tourist destination all year long (and quite popular with locals, as well). Even though it's getting a little chilly out, there's still lots to do at the Garden, including the Holiday Model Train Show, the Reindog Parade and Holiday Chocolate High Tea.